This article is a work in progress as we find out more on all the products. We already have a lot of info, just polishing off those odd corners! Some New Features, But Much of The Same? Earlier this year Intel accidentally released a full Z390 product brief. And while it cleared up some aspects of Intel's not-so-public roadmap, it left other points hazy and opened up conjecture on what Intel might actually implement to make the Z390 attractive to consumers. Especially as some have already adopted one of their current Z370 motherboards, which will also support the new CPUs. The Z390 chipset is something of a late bloomer, in that its fellow Cannon Point family of 14nm chipsets were first released back in April. 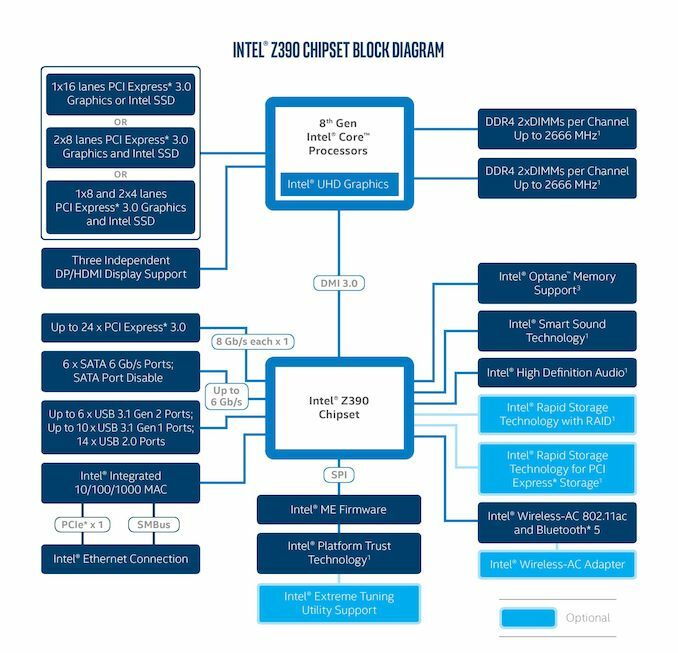 As a result when it comes to the shared features of the latest chipset generation, Intel has already shown its hand, particularly with the virtually identical corporate-focused Q370 chipset. 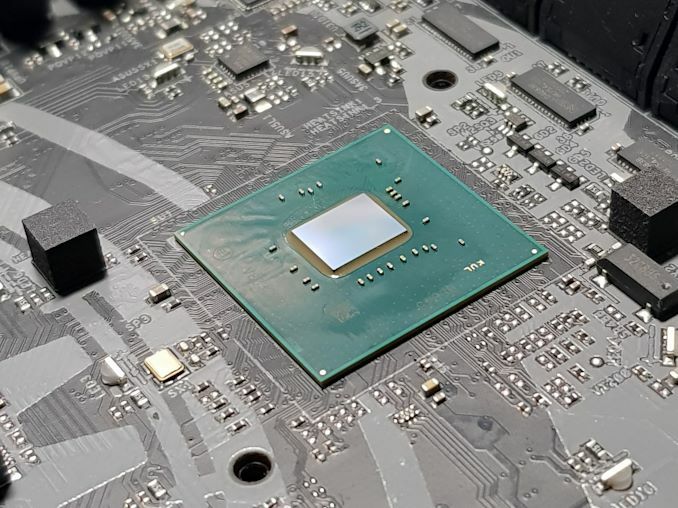 None the less Z390 is still an important release for the company and for its customers, as it finally brings these features to a chipset that also supports overclocking. At a high level then, no matter your point of reference, most of the plumbing is the same for Z390 as past high-end Intel chipsets. The underlying fabric still offers 30 High Speed I/O (HSIO) lanes, which are then configured and distributed to support various features such as USB ports, SATA ports, and PCIe lanes. Unfortunately Intel has not provided us with a breakdown of HSIO lane allocations for Z390, so right now we don't know what features are shared among which lanes. But we do know that in total, up to 24 of those 30 lanes can be allocated to PCIe. Though do keep in mind that the backhaul to the CPU is still a DMI 3.0 connection, with is analogous to a PCIe 3.0 x4 connection. Meanwhile in terms of features, Z390 does bring a few new things to the table that Z370 didn't offer. The biggest change for enthusiasts is probably support for chipset-native USB 3.1 Gen 2 (10 Gbps) ports. Motherboard manufacturers will have to use HSIO lanes to enable USB 3.1 Gen 2 (10 Gbps) ports, with up to six being supported on Z390. And while we don't have that HSIO map, it's very notable that Intel supports fewer Gen 2 ports than Gen 1 ports (10). Taking an educated guess here, as 1 HSIO port (8 Gbps) isn't fast enough to feed a USB 3.1 Gen 2 port (10 Gbps), it looks like mobo manufacturers will need to use 2 HSIO lanes per Gen 2 port. Which is to say that board designs will need to carefully balance how many of these valuable lanes are allocated to USB 3.1 Gen 2 ports versus other functionality, because these faster ports won't come for free. Consequently I expect board vendors to treat Gen 2 ports as a premium feature, with only the top flagship offerings making use of more than two. Physically speaking, each these ports can be in the form of either a motherboard header, a USB Type-A port, or a USB Type-C port. As with other Type-C implementations, a re-driver is required in order to implement a Type-C port, so that will be another factor in the calculus board makers use when allocating their ports. The other big and welcomed addition to the Z390 chipset is integrated 2T2R 802.11ac Wi-Fi support, allowing the latest Wave 2 (160 MHz) channel communications and offering speeds up to 1733 Mbps. Intel's wireless networking upgrade also brings integrated Bluetooth 5 support, with the latest standard offering both longer range modes as well as higher bandwidth modes. These CRFs do cost extra however, so not every Z390 motherboard will feature Wi-Fi support. A complete, working Wi-Fi implementation can easily add $15 to the cost of a motherboard; a premium that some users won't be willing to pay, especially if wireless isn't a personal necessity. But on the flip side this is a cheaper and easier route for board vendors that do want to add Wi-Fi, allowing for Z390 versions of feature-laden Z370 motherboards, such as the ASUS ROG Z370 Hero AC, to be built for less. Also on the plate for the chipsets are features like Modern Standby/Smart Connect, allowing for systems to update email and such while in a sleep state similar to some laptops. Intel's ‘ambient computing’ technology is also making the jump from laptops to enthusiast desktops thanks to the Z390 chipset. This allows for wake-on-voice in a low powered mode, much like a smartphone or connected device that the user can call Cortana or Alexa while the system is in screen-off or Modern Standby. Overall, relative to prior Z-series chipsets, the Z390 is the first real and significant chipset silicon update in a while. Nonetheless, the differences are few; users who have already adopted the Z370 chipset with Intel's 8th Generation of Coffee Lake processors are undoubtedly not going to feel the need to upgrade to a Z390 model, especially as USB 3.1 Gen 2 ports and Wi-Fi can be added with PCIe cards. Instead Z390 is geared more towards new system builds, particularly those based around the new high-end 9th Gen Core CPUs. And even then, for cheaper options we're hearing that Z370 boards will work with the new CPUs so long as the right BIOS is installed. With motherboard manufacturers clearly itching to get their boards to market – and from the nature of Intel's accidental release, they've probably been sitting on these designs for some time now – we've put together a comprehensive list of most of the Z390 boards we know about thus far. Below is a total of 55+ new Z390 motherboards launching this week, with more to come at a later date, such as the NZXT N7 Z390, GIGABYTE Z390 Aorus Xtreme, and much shrouded EVGA Z390 Dark model with two RAM slots on an ATX sized PCB. ASrock: has a total of 11 new models, with its new Phantom Gaming series making its debut. Also rolling out are a revamp of their previous Z370 Taichi models, resulting in the Z390 Taichi and the slightly higher spec Z390 Taichi Ultimate. ASUS: has the largest Z390 product stack at launch, with a total of 17 new boards. Included in their product stack is a refresh of their high-end Maximus motherboard, as well as the TUF Gaming and Strix ranges making up the gaming side. The Prime series offers three new models with a focus on the entry-level, while the new WS Z390 Pro is designed for prosumers and workstation users. EVGA: has a pair of new models prepped and ready for the Z390 chipset. But the current availability and pricing for both are still unknown at this point. GIGABYTE: has a similar stack to ASRock, with 11 new models to complement the release of the new Intel 9th generation processors. The flagship Z390 Aorus Xtreme has yet to be formally announced, but it is coming most likely in late October or sometime in November. MSI: also has 11 new models for Z390. The new MEG Z390 GODLIKE looks set to be an interesting addition with the inclusion of a dedicated streaming and capture card. NZXT: is preparing a new successor to the much-discussed N7 Z370, with the new N7 Z390 expected to land on the retail shelves sometime in November. Supermicro: has four brand-new boards launching on the Z390 chipset, with many of their durable server-grade technologies making their way onto desktop consumer based boards. Of particular interest here, the Supermicro P9Z390-PGW has a dedicated PLX PEX8747 chip which allows for four-way SLI multi-graphics card configurations. Over the page we get into a thorny topic of late, power delivery, and then move into an analysis of each board we could find out about on launch day.